Although this photo is of the Western span of the San Francisco - Oakland Bay Bridge, the currently built replacement of the Eastern span was proposed to be named in the honor of Emperor Norton I, The Emperor of the United States and Protector of Mexico. The proposal failed. It's a pity that the authorities didn't have a sense of humor about renaming the bridge in the honor of the Emperor. His Imperial Majesty, Norton I, was a San Francisco citizen who in 1859 proclaimed himself the Emperor of the Unites States. Although, people considered him to be loony, they played along; He used his own currency to dine for free in restaurants, the police saluted him, and the newspapers printed the proclamations that he issued. In his most famous decree, he ordered San Francisco and Oakland residents to build a bridge and a tunnel connecting the two cities. 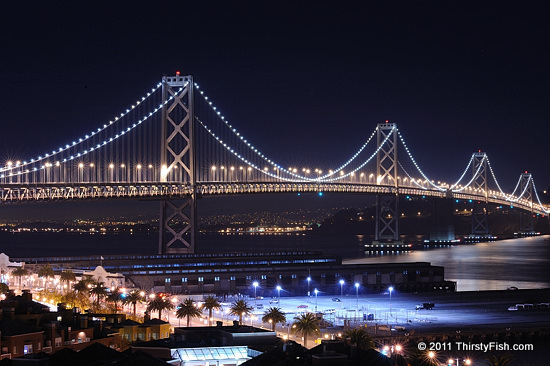 This was realized with the construction of the Bay Bridge in 1936, and the completion of the Transbay Tube in 1969. Emperor Norton's funeral in 1880 was attended by up to 30,000 people; over 10% of the San Francisco population at the time. Even today, some stores and restaurants in San Francisco have signs that say, "By Appointment to His Majesty, Emperor Norton the First".